Holidays, especially the Christmas Day in most of the United States mean gathering, small crowds of family and friends, and celebrating the holidays. As they all get off their cars in front of the family member’s house holding the dinner, they enter to a cheery house with people greet them with open arms. They all look forward to chit-chat, good food, drinks of course, and later to complain about the nosy aunt or snoring uncle. People getting together at one place means they will not be where they would otherwise be on a normal day. And, that means the streets, towns, cities get empty, eerily empty, all clearly visible on the empty streets. 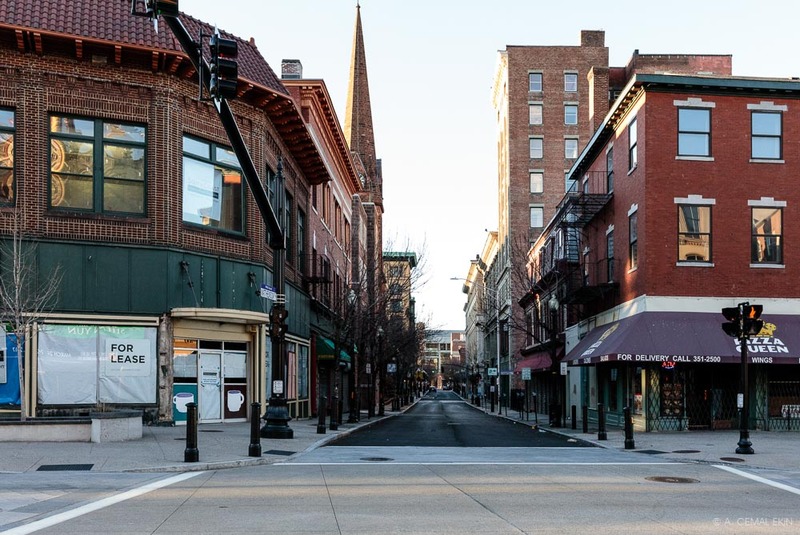 This Christmas Day, I decided to drive around and take photographs of the streets, parking lots, nearby places, as well as downtown Providence. Parking was no problem at all, and any place was “legal” parking space; there was nobody around. I first started around the corner on Warwick Avenue which gets a good amount of traffic in mid-afternoon. In both directions, the roads were empty, bar an occasional driver, soon destined to knock on a door. Then I drove to Pawtuxet with a strip of stores, a bank, coffee houses, and so on; not a soul around. Surely there would be some traffic on Narragansett Blvd. then on Allen’s Avenue. Nope! I parked and looked at the busy intersection which did not look anyway near its daily hustle and bustle. I have been meaning to stop there and photograph the jungle of cables, poles, fences with the skyline of the city behind them. No problem hanging around and taking as many as I wanted while illegally parked right on the street. Continuing on Allens Avenue, I wanted to turn left on Richmond Street and noticed the intersection ahead unusually quiet. No cars on Allens Avenue nor on Point Street; the corner of Davol Square looked deserted. Going on Richmond Street, I arrived at Weybosset Street, Providence Performing Arts at the corner had a “Drop Off Only” driveway. It was clearly left for me, and I pulled in and parked right on the road; it was mine today! There I took several photographs resembling the old postcard I used in the post about Save Superman Building effort. It looked largely the same. I drove slowly, nobody behind to get ticked off at me, towards the finance center and stopped just before the Turk’s Head Building. I wanted to get some photographs of the Turk! It was as imposing as ever, but missing the noise of the kids skateboarding right before his eyes. I managed to take photographs from several angles, one being from smack in the middle of the square. No worries of a car coming by. From there, I drove towards South Water Street right by Providence River. Although it is not usually very busy, it looked particularly empty that day. I parked somewhere and photographed looking towards Wickenden St. as well as in the opposite direction looking at the center of the city with several skyscrapers drawing its skyline. Moving along, I arrived at the Point St. intersection and parked right at the intersection. I must admit, there were more cars going through that corner than I saw in other places. But you will see the streets empty, partly because I slightly delayed taking some photographs but mainly because it was nearly empty. Taking a right turn on Point St. I started the trip back home. Now it was around 4 PM, and some folks were probably returning home, tummy full, and perhaps a bit tipsy! There was a little more traffic on the streets, but nothing to compare the daily traffic by any stretch of the imagination. Pretty much on the same path I came, I headed back home with another pit stop in Pawtuxet. Broad Street was empty in both directions and the parking lot of a busy small plaza was decidedly empty, like all the streets on Christmas Day. And the old-fashioned street lights just came on. Shortly, I was home warming up. Reminded me of a new year’s eve back in my bachelor days, when I had decided to go to the cinema. There were two of us as watchers, and the “koltuk gösteren” guy, who did not even bother to usher us in and take any money. That was the most peaceful cinema experience I had in my life. The film was “Otobüs”, Swedish Turkish stuff if you can remember. I admire your creativity and being able to squeeze out interesting photographs under virtually any situation. I had never thought there would be that many overhead lines in the States. Looks terrible, as elsewhere out here. Türkan and I wish Jan and you a happy, healthy and prosperous 2017! Happy 2017, and beyond to you and Turkan as well. Be well. I had a very interesting tour of your town that I have been to ages ago! Thank you for the revisit! I have thoroughly enjoyed it. The Turks Head is my favourite feature. Such emptiness lets one see the town. I had a similar experience in Istanbul once during probably a census when I had to go to Sishane THY for some reason. The Turk’s Head building is one of my favorite buildings in Providence too. You are eerily aware of all your surroundings at all times. Your recall of the skateboaders that were present during previous visits substantiates your keenness for detail and life that surrounds you. Very much enjoyed your images, how they were presented in the frame and you blog. Thanks Jim, I am glad you enjoyed the familiar places with no people or no cars. Awareness is a fundamental component of seeing, so, thank you for your compliment.